If you’re an office worker or a computer programmer than you probably spend quite a bit of time in your chair, at least five days a week. An office chair that’s uncomfortable can lead to a number of upper and lower back problems and can also have a major impact on your productivity at work. But finding the right ergonomic chair for the office can be difficult, considering the hundreds of models on the market to choose from. Serta is a company that’s famous for their extensive lines of mattresses and box springs, but their innovative line of ergonomic office chairs are taking the market by storm, due to their low pricing and extra thick cushion layering design. The Serta Back in Motion ergonomic chair is designed to reduce the effects caused by sitting for a prolonged period of time. The chair’s durable design and high quality components works to ensure this model’s overall longevity. Equipped with softened bonded leather and hand sculpted arms, this chair offers a modern look that will complement any workspace. This chair is priced more affordably than the other models of ergonomic chairs we reviewed, but does it have what it takes to beat out the competition, or do you truly get what you pay for? For a company that specializes in products designed to give consumers a great night’s rest, it comes as no surprise that they’ve designed their own innovative line of ergonomic office chairs that will allow users to sit at their desks for extended periods of time in total comfort. This is an ergonomic model that comes with innovative seating technology that will tilt the user’s pelvis forward when they lean back in order to keep their back in a more neutral position. This design promotes a heathy pelvic tilt motion which works to reduce compression and increase circulation, providing the user with ongoing relief and comfort. As the user corrects their spinal health, the body will gradually change how it uses the proper body mechanics. Users will quickly begin to feel the long term health benefits that come with reducing discomfort, stress and strain while at work. The layered pillows on this chair provide a ton of cushioned support to crucial areas of the body, offering a more comfortable seating experience that provides much needed relief as you work. The chair’s controls allow you to easily and quickly adjust the tilt and height, so the chair can be adjusted to meet each user’s needs. The pneumatic lift with the lock out feature and adjustable tension ensures the feet are correctly positioned, while the innovative arm controls ensure the user will experience plenty of support on the forearms, wrists and hands, providing total body comfort. 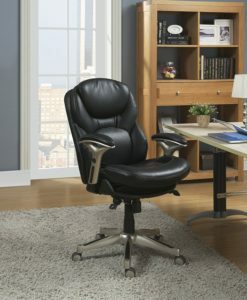 The chair itself features an eco-friendly bonded leather covering for the ultimate comfort. Pros: This chair comes with a substantial amount of padding, including the armrests and a slight recline to the back of the chair. The support system, contours and shape of the chair are its best features. The BIM active lumbar support pivots for improved lumbar support and the deep layered body pillow design offers ongoing support instead of the typical cushion style setup you typically see on lower priced office chairs. An incredibly easy chair to use consumers can adjust different parts of the chair in order to meet their needs. The armrests are equipped with a modern push button system for dropping or raising the seat to the required height, which is powered by a pneumatic lift. According to consumers, assembly will take approximately fifteen minutes. The included instructions are very straightforward and simple to follow. The pivoting back and seat are one of the chair’s best features. 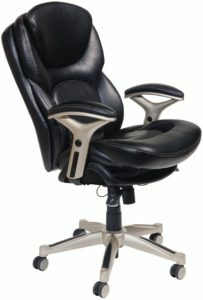 This chair also offers consumers a modern and almost elegant design that will easily match most office spaces. Cons: Some consumers felt that the pneumatics in this chair were a little too tall for people under five feet, four inches tall. Consumers also had complaints regarding the fabric on the seat. One consumer stated that after just one year of use the fabric on the seats began to tear and the seat itself began to lose its shape. Unfortunately, because this model only comes with a one year product warranty, the consumer had to pay for repairs out of their own pocket. In fact, a number of consumers complained that just after a few months the seat became very flat, offering zero support. Some consumers were disappointed in the fact that this chair is only available in one color and size option. Consumers who purchased this chair seemed to share similar complaints in regards to the integrity of the seat and the fabric that covers it. Over a period of three to six months the seat flattens out, making the chair pretty much unusable. Some consumers recommended adding a thick foam cushion on top of the seat to make it more comfortable. But the argument here is truly the price of the chair. This is the lowest priced chair we reviewed, so it comes as no surprise that it’s not equipped with the type of high quality components and materials that will allow you to use your chair for several years to come. An office chair, especially one you’ll be stuck in for eight to ten hours a day, five days a week, is an investment and one that will outlast its warranty, if you’re willing to fork over the kind of cash the high quality chairs are going for. Considering Serta Back in Motion Mid-Back Office Chair is a lower priced model and the main issue with it involved the padding on the seat, most consumers gave it a rating of four out of five stars for the initial comfort it offers, high adjustability and the reasonably low pricing. If you’re willing to pay extra for a chair that will last, consumers recommend taking a look at the Ergohuman high back swivel chair, which is a model that received a high consumer rating for comfort and durability.